Brittany Wagner is only in the eighth grade, but she couldn't wait to get to college last weekend. That's because her best friends are a couple of Penn State University college students. Brittany, 13, is just shy of two years into treatment for T-cell lymphoblastic lymphoma, a rare type of blood cancer. She spent the weekend at the Penn State IFC/Panhellenic Dance Marathon, the largest student philanthropy in the world, where more than 700 college students took to the dance floor for 46 hours straight to raise money to fight childhood cancer. Watch: Could you step up and dance for 46 straight hours? Since 1977, Penn State's Dance Marathon, commonly referred to as THON, has raised more than $114 million to benefit the Four Diamonds Fund at Penn State Hershey Children's Hospital. 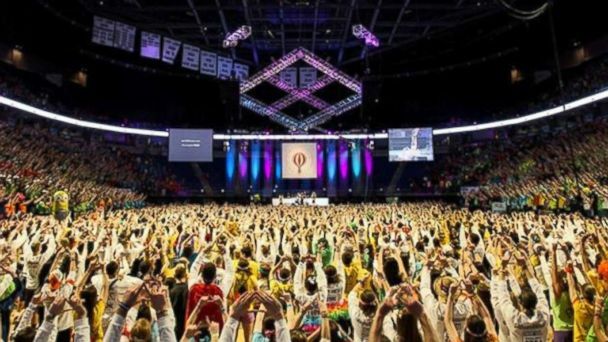 This year THON raised a record $13.3 million for pediatric cancer, thanks to donations. According to the American Cancer Society, approximately one in 285 children will be diagnosed with cancer before the age of 20 in 2014. This past weekend, Brittany couldn't wait to see Ryan Cusack, 22, and Allison Lederer, 21, at THON. Cusack and Lederer both play for the water polo team. She and her family cheered the two on as they participated in the dance marathon. "They adopted us and we adopted them too," said Lori Wagner, Brittany's mother. "They call it your THON family for a reason, because they really are your family." Just before the 46-hour marathon started, Lederer told ABC News: "These kids do extraordinary things. … And it's just amazing what they can do, so if we can do this for 46 hours it's just a little momentum to them." After a countdown at 6 p.m. Friday, the epic dance marathon started - no sitting, sleeping and caffeine for 46 hours straight. "It's not crazy. It's all mental. There's nothing you can't do. Really it's not impossible. It's just a bunch of kids doing an extraordinary thing," Cusack said. By hour 33 of the dance marathon, Lederer, however, had nearly lost her voice. "Whatever your pain you're feeling now is just a small part of what they do every day," she said about the Four Diamonds children. "So you get through it just like those little boys and girls do every day." Ryan Patrick, a senior at Penn State, and THON's executive director for 2014, said that 15,000 Penn State student volunteers had actively fundraised, planned and run THON. The Four Diamonds Fund's mission is to conquer childhood cancer. So far it has helped more than 3,300 families. This year alone 500 families received support from the fund. Suzanne Graney, the fund's director, said the group had researchers "on the brink of breakthroughs" in pediatric cancer research. In 2013, 93 percent of the Four Diamond Fund was spent on patient and family costs and patient care providers, including 69 percent of expenses directly funding cancer research. Bob Wagner, Brittany's dad, told ABC News it was nice to check the mail every day and know "you'll never see a medical bill." Brittany gets intravenous chemotherapy every four weeks, has a spinal tap every three months and takes oral chemotherapy every night, but she is responding well according to her clinical team at the Penn State Hershey Children's Hospital. She is expected to finish her therapy in June. Last year 100 elementary, middle and high schools across Pennsylvania participated in mini-thons raising $2 million for the Four Diamonds Fund. This year the number has grown to 130 schools in the state. The THON movement has also inspired colleges across the country to start their own dance marathons - UCLA's version of THON has raised $3.5 million to fight pediatric AIDS. "Everyone is inspired by Penn State THON. They're like celebrities in the world of dance marathons," said Andrew Ho, a senior at UCLA and president of the Pediatric AIDS Coalition at UCLA. ABC News' Catherine Cole, Alexandra Ludka, Mark Abdelmalek and Sara Haines contributed to this story.